Galan Lithium Ltd (ASX:GLN) has achieved promising results from the first samples taken from its maiden drillhole at the Candelas Lithium Brine Project in Argentina. The results provided substantial share price momentum, as the value of the company increased by approximately $10 million. Initial assay confirmed, high grade lithium bearing brines with low impurity levels comparable with the high quality brines currently being mined at Salar del Hombre Muerto. The drillhole (C‐01‐19) successfully encountered a substantial intercept of brine from depths ranging between 235 metres and 354 metres within coarse clastic sediments to 311 metres and fractured basement lithologies from 311 to 354 metres. Approximately 120 metres of brine was encountered from a depth of 235 metres to the current base of 354 metres. Investors reacted quickly and positively to the news with the company’s shares hitting a high of 43 cents, representing a gain of approximately 37%. 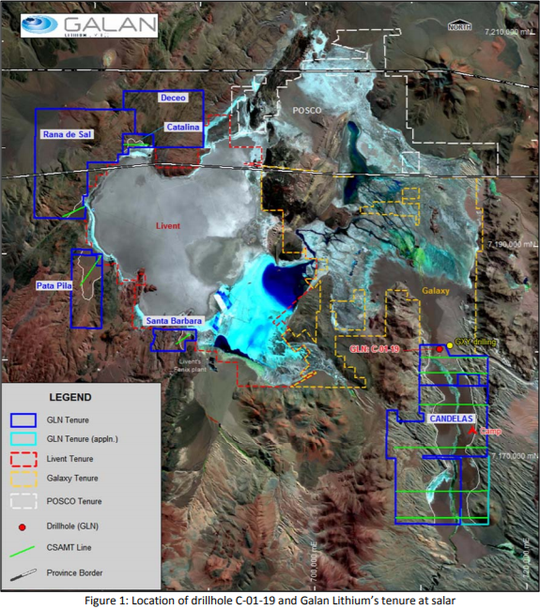 Galan is exploring for lithium brines within South America’s Lithium Triangle on the Hombre Muerto salar in Argentina and surroundings. Hombre Muerto is proven to host the highest grade and lowest impurity levels within Argentina and is home to Livent Corporation’s El Fenix operation and Galaxy Resources and POSCO’s Sal de Vida projects. Galan’s primary target is the adjoining Candelas channel, a basin that is approximately 15 kilometres in length infilled with sediments hosting the brines. Consequently, a maiden hole hit of this nature is an outstanding result, and perhaps signals that there is further good news pending. Underlining the significance of these developments and how they will shape the exploration program, Galan’s managing director, Juan Pablo Vargas de la Vega said from his base in Argentina, “To encounter lithium grades of this tenor with low impurities in our first hole is remarkable and has given us further encouragement that the Candelas project has the potential to host a significant resource of lithium bearing brines. “The team is working full steam ahead to advance the programme and we intend to fast track exploration along the 15 kilometre extent of the project”. Recent geophysics, and now drilling indicates that it has the potential to host a substantial volume of brine. The results were described as exceptional in that they confirmed the presence of high grade lithium bearing brines within a geological setting unique to the Hombre Muerto salar. 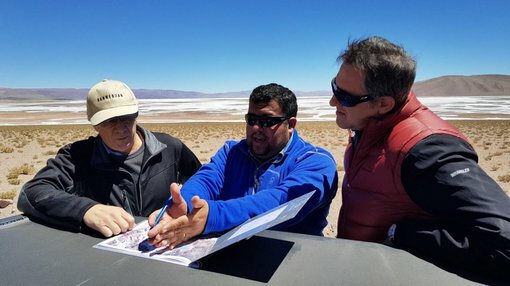 On this note, SRK Consulting (Argentina) Senior Consultant Geologist Camilo de los Hoyos said, “Preliminary field measurements and laboratory analyses on brine suggests that the Candelas Project has the potential to become a world‐class soluble lithium deposit hosted in a unique geological setting. “Further results from exploration must be assessed step by step to define matrix specific yield and hydraulic conductivity, brine quality and aquifer geometry”. A further bonus is the presence of potassium in volumes high enough to be considered as a by-product in the event that the project progresses to an economic brine deposit.